On this day exactly 26 years ago, an estimated 4,000 people died when the passenger ship MV Doña Paz collided into M/T Vector oil tanker near Marinduque province. Given the death toll, the incident is now referred to as the worst peacetime maritime disaster in world history, surpassing Titanic. Despite being the subject of intense public backlash, the tragedy didn’t force Sulpicio Lines, the owner of MV Dona Paz, out of business. In the quarter-century since the MV Doña Paz tragedy, more vessels owned by Sulpicio Lines became involved in deadly sea mishaps. In October 1988, MV Doña Marilyn ferry sank off Leyte province after being battered by a typhoon, killing more than 250 people. 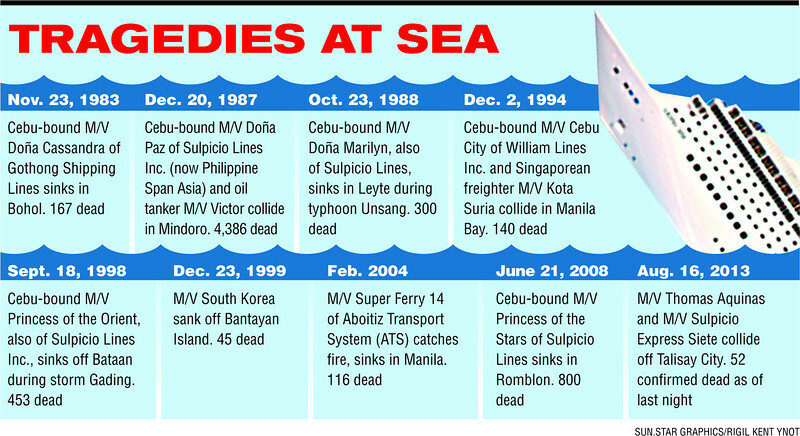 In 1998, 150 people were killed when the firm’s MV Princess of the Orient sank in a port near Manila also because of bad weather. Another ship owned by Sulpicio Lines is the MV Princess of the Stars. Its journey from Manila to Cebu was cut short when it capsized off the waters of Romblon during the onslaught of Typhoon Frank. Only about 57 of the 850 people on board survived. This prompted Lingayen-Dagupan Archbishop Oscar Cruz to quip that the said shipping line should consider entering the mortuary business. Instead of being held accountable for its negligence, the company merely changed its name to Philippine Span Asia Carrier Corporation (PSACC). Despite the name change, the curse continued to hound Sulpicio Lines. Just this August, MV St. Thomas Aquinas and MV Sulpicio Express 7 collided in a Cebu port. Nearly 100 people died in the tragedy. At the height of this latest tragedy, The Filipino Scribe reached out to Levi Samuele for comment. His brother Roy and three-year old niece Jacqueline were among the passengers of the ill-fated MV Princess of the Stars. He serves as the de facto spokesperson for their group. In his response, he noted that their group decided not to issue public comments about the MV St. Thomas Aquinas mishap lest they be accused by Sulpicio Lines of grandstanding. “Syempre nararamdaman namin ang kanilang damdamin noong lumubog at nawala din ang aming mga kamag-anak. Syempre pinaka-masakit yung ‘di na talaga nakita ang mahal mo sa buhay,” he said. He also challenged the assertions made by Sulpicio Lines officials that the company is losing money. “Kung nalulugi na sila, bakit patuloy pa rin sila sa pag ooperate? (If they are really bankrupt, why are they still operating),” Samuele asked. Last April, a division of the Court of Appeals junked charges of reckless imprudence resulting in multiple homicide, physical injuries, and damage to property lodged against Edgar Go, vice president for administration of Sulpicio Lines. This decision only highlights just how tough it is for relatives of those who perished during the sea mishap to achieve justice. Losing a loved one unexpectedly is in itself a very heart wrenching experience. The lack of accountability aggravates the pain tenfold. “Sana nagsara na nga lang sila para wala nang maaksidente pa ulit na sila na naman ang sangkot, at pagkatapos tatalikuran na naman nila ang obligasyon nila!” Samuele told The Filipino Scribe. What company, regardless of their clear neglect for human life, will shut down given that they can easily get away with their crime? *Don Mariano Bus Company is dominating the headlines this week after one of its buses fell while traversing the skyway toll road in Taguig City, killing 22 passengers. Like Sulpicio Lines, this particular bus firm has also been involved in another accident before. Will the owners be held accountable, or will the culture of impunity persist? This entry was posted on Friday, December 20th, 2013 at 9:00 am	and tagged with culture of impunity philippines, don mariano bus accidents, levi samuele sulpicio lines, mv dona paz tragedy, mv princess of the stars tragedy, philippine sea tragedies, sulpicio lines, sulpicio lines new name and posted in commentary, hodgepodge, philippines. You can follow any responses to this entry through the RSS 2.0 feed. Let the companies be accounted for what they have done! Let them pay for the damages, let’s be serious about the safety of the people, cancel their franchises for good!